According to published research, chronic musculoskeletal pain conditions account for four of the top nine diseases that contribute to years lived with disability in the United States. 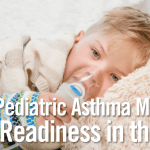 These disorders are associated with significant adverse health-related, work, and economic effects on patients. In many cases, conventional analgesic therapy is only moderately effective in many people who suffer from these conditions. As such, strategies are needed to augment standard pain treatments for chronic musculoskeletal pain. Studies suggest that treating common psychological comorbidities may help in the managing of patients with chronic pain. “Chronic pain sufferers frequently report experiencing many comorbidities, including depression, pain catastrophizing, and anxiety, among others,” says Kurt Kroenke, MD. Researchers have suggested that the severity of these comorbidities is related to the degree of pain and pain-related disability. However, few studies have explored the independent effects of depression, anxiety, and pain catastrophizing on pain outcomes over time. “Understanding the relative influence of these psychological conditions on pain outcomes is important to help us refine our understanding of how we manage people living with chronic pain,” Dr. Kroenke adds. For a study published in the Journal of Pain, Dr. Kroenke and colleagues analyzed data from 250 patients enrolled in the Stepped Care to Optimize Pain Care Effectiveness (SCOPE) trial. SCOPE participants were managed in the primary care setting and had chronic musculoskeletal pain, and investigators gathered various data points at baseline and at 3 and 12 months. The study authors then examined if changes in depression, pain catastrophizing, and anxiety could predict a subsequent reduction in pain intensity or interference and pain-related disability. “Patients with chronic pain who exhibited improvements in depression, anxiety, and pain catastrophizing scores on screening tests experienced reductions in their intensity of pain and disability from their pain,” says Dr. Kroenke (Table). Improvements in depression appeared to have the strongest benefit, followed by improvements in pain catastrophizing and anxiety. “The beneficial effects of psychological improvement on pain outcomes were significant even after we adjusted for the effects of optimizing the use of analgesic medications,” adds Dr. Kroenke. The benefits regarding pain-specific disability were also stronger for those who had improvements in these mental health domains. Optimization of analgesics and improvement of psychological comorbidity each had discrete effects on the reduction of pain in the study. “Our study suggests that optimizing analgesics in conjunction with treating concomitant psychological comorbidities might have additive benefits in reducing pain intensity or interference,” says Dr. Kroenke. “It may be particularly important to reduce catastrophizing because these individuals may experience a cascade of events that inhibits their chances of achieving pain relief.” The study group noted, however, that the more complex interaction between anxiety and analgesic optimization on pain disability warrants further study. There are currently many brief measures for detecting and monitoring depression, anxiety, and pain catastrophizing. Dr. Kroenke says assessing these psychological factors is important because they can exacerbate pain and adversely influence pain outcomes. “These comorbidities must be addressed in order to optimize how we manage patients,” he says. Assessments of these comorbidities are also important for when researchers conduct studies that interpret pain outcomes in clinical research. Effective treatments are available for the psychological comorbidities examined in the study. These therapies should be considered when they coexist in patients with chronic pain, particularly if pain does not respond adequately to conventional analgesics and non-pharmacological pain therapies. Increasing the number of mental health professionals trained in caring for pain patients. Incorporating mental and behavioral healthcare into patient-centered medical homes. Reinvigorating and incentivizing multidisciplinary pain care. Advocating for quality indicators that assess pain and psychological metrics. Scott EL, Kroenke K, Wu J, Yu Z. 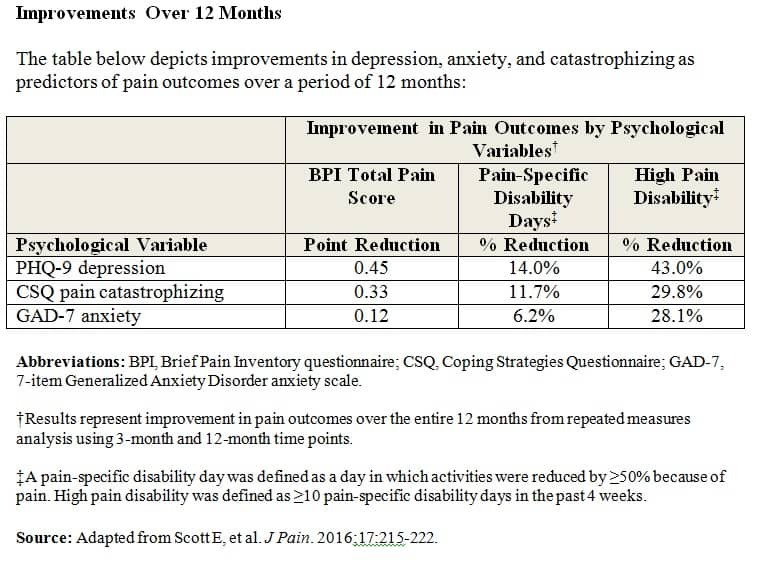 Beneficial effects of improvement in depression, pain catastrophizing, and anxiety on pain outcomes: a 12-month longitudinal analysis. J Pain. 2016;17:215-222. Available at: http://www.jpain.org/article/S1526-5900(15)00926-8/fulltext. Kroenke K, Krebs EE, Wu J, Yu Z, Chumbler NR, Bair MJ. Telecare collaborative management of chronic pain in primary care: a randomized clinical trial. JAMA. 2014;312: 240-248. Kroenke K, Wu J, Bair MJ, Krebs EE, Damush TM, Tu W. Reciprocal relationship between pain and depression: a 12-month longitudinal analysis in primary care. J Pain. 2011;12:964-973. Kroenke K, Bair MJ, Damush TM, et al. Optimized antidepressant therapy and pain self-management in primary care patients with depression and musculoskeletal pain: a randomized controlled trial. JAMA. 2009;301:2099-2110. Kurt Kroenke, MD, has indicated to Physician’s Weekly that he has or has had no financial interests to report.